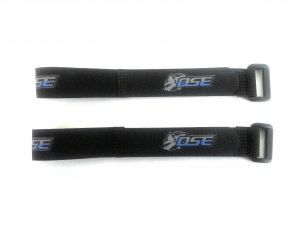 OSE battery straps. Black in color with OSE logo, 2 straps per pack. Hook and loop style closing with heavy duty plastic buckle. 200mm are good for a 2s 4000-5000mah Lipo Pack. 300 and 400 sizes can be used to wrap around packs, see picture two. 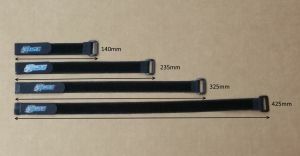 500mm strap around a 4s pack length wise. Lengths available (See picture three measuring details). 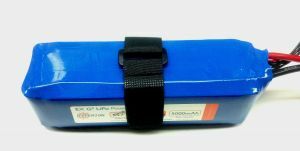 Measure (width + height) x 2 for the strap size you need. For example (50mm + 20mm) x 2 = 140 working length. 200mm total length : working length 140mm ( 5.50"). 250mm total length : working length 185mm ( 7.25"). 300mm total length : working length 235mm ( 9.25"). 400mm total length : working length 325mm (12.75"). 500mm total length : working length 425mm (16.75"). Battery and other parts used for example only (not included).